It's time for Challenge #275 at Little Red Wagon. Carolyn has chosen the theme of this week's challenge. She has decided to play peek-a-boo with us. That's right - windows in our cards! Well, that was easy for me. 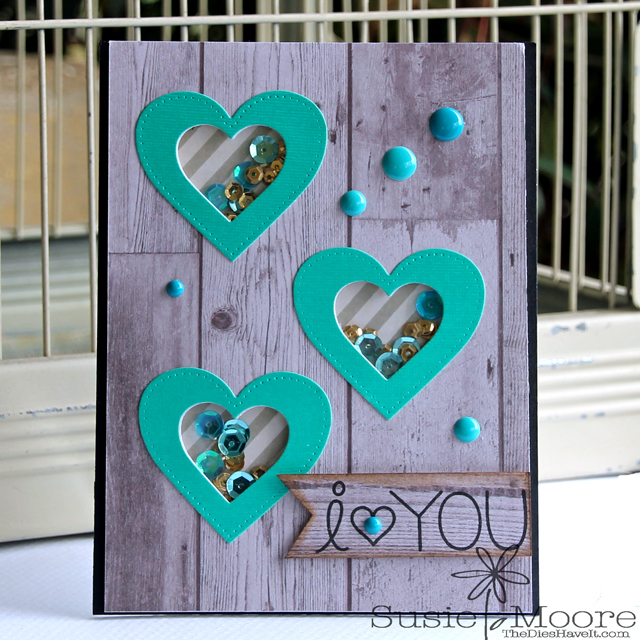 I love making shaker cards, so this time I decided to make little heart windows. It was so much fun to see just how many sequins would fit in the small windows. They really do shake - just a little, but they shake! You can see Carolyn's card on the Little Red Wagon blog by clicking right here. Then be sure to check out what all the girlfriends have created for this challenge. The links are to the right (and then scroll down a little) of this post. Once you have been totally inspired, be sure to create your project and link it up on the Little Red Wagon blog. It's peek-a-boo time....I hope you'll play along with us this week! Ack!!! I love this. Wouldn't it be awesome if we could have heart windows in our house? Amazing job, as always. Ooooh, awesome card, Susie! I love shakers, have never made one with more than one shaker element though, gonna have to try that! I like the little shaker heart windows very much. And I also like the use of the non-traditional colours for Valentine's Day. Hugs.